Jimmy is a big fan of another humorous Irish Catholic writer, Father James Martin. 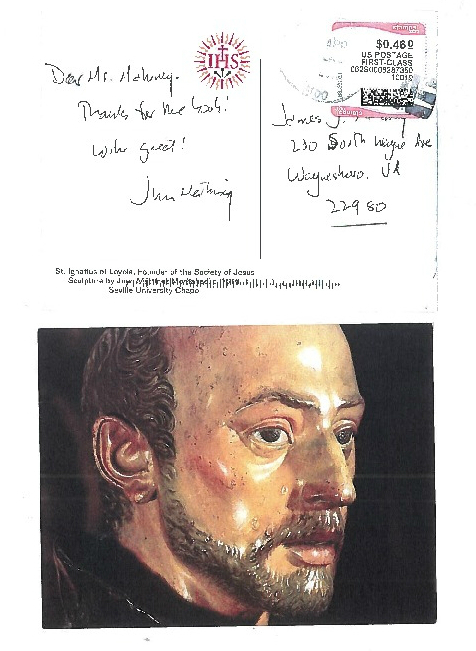 Here’s a postcard that Father James Martin sent to Jimmy after receiving The Secrets of Little Saints. If you are unfamiliar with James Martin’s work, you might want to check out The Jesuit Guide to (Almost) Everything: A Spirituality for Real Life or My Life with the Saints. Both are great reads for Catholics and Non-Catholics alike.